The name of the F. M. Weiler's Liberty Machine Works has been changed to the Liberty Machine Works, and they have moved from 51 Beckman to more commodious quarters at 54 Frankfort street. The October 1888 issue had a 4-page article going into detail about the "The Reconstructed Liberty and its Improvements". You can follow links to scans of individual pages. NOTE: these are large (3Mbyte) files. Page 12: conclusion of article. May 1886, p. 513: First ad I located in this volume. A full-page ad with a drawing of the press showing the throwoff and a feedboard swung out to the left. October 1886, p. 16: 1/4 page ad; feedboard shown to left. 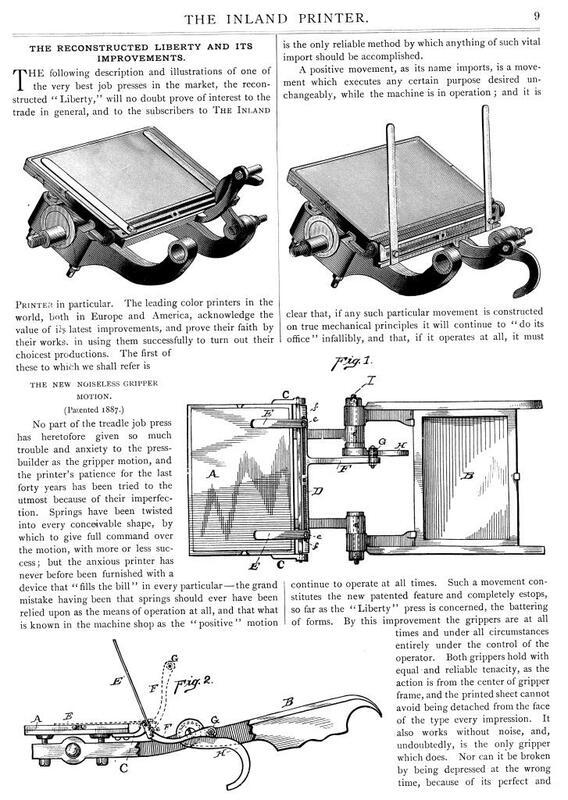 p. 68: The Liberty Job Printing Press On press - "The F.M.Weiler Liberty Machine Works" Feedboard to left. 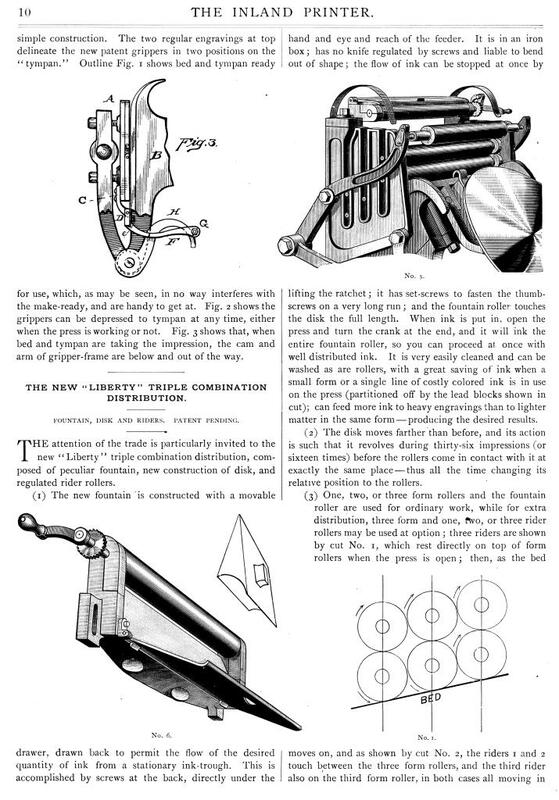 p.126: The New Liberty Printing Press...No More Noise (1/2pg) List of 6 complaints of the old "Degener"
The Grippers are no longer regulated by springs, but move steadily and quietly by a cam. The Throw-off is neither on the wearing shafts nor on the connecting arms, thus creating no extra wear and tear, nor interfering in any way with the distribution. It is directly behind the platen, and so always under the hands of the feeder, positive in its movements and cannot get out of order. 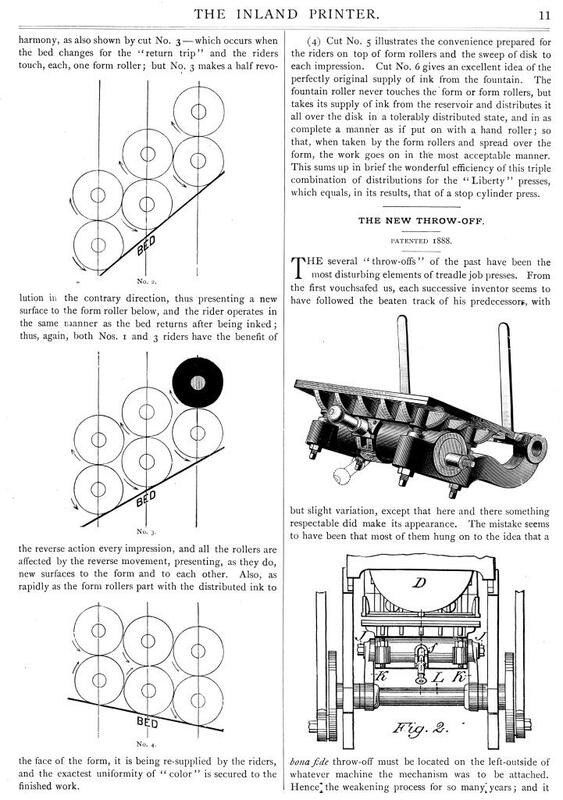 The placing of the solid shaft through the platen beam, where there used to be only bolts, not only strengthens the Press, but does away with the noise. The Fountain is adjusted by screws, within reach at all times without leaving the feed-board or stopping the Press. The extra Distribution is accomplished by putting one, two, or three rider rollers on top of the form rollers. 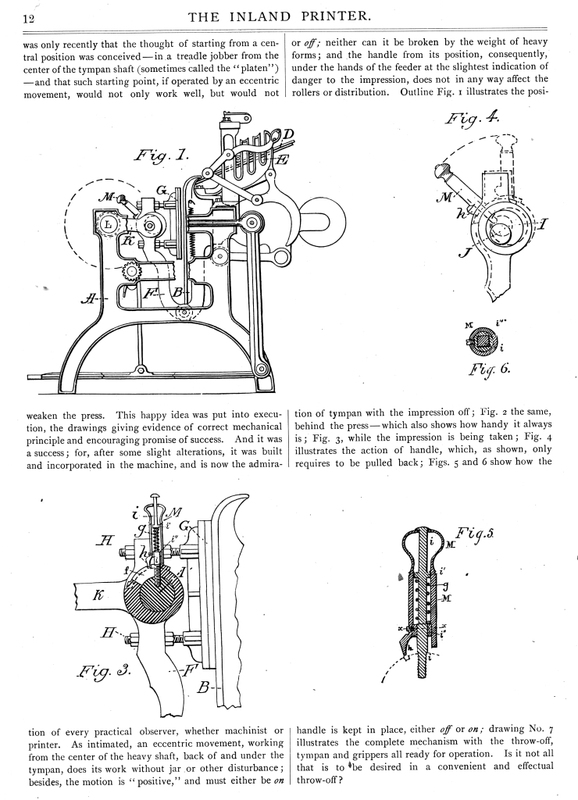 The combined Brake and Shifter is very simple and very convenient, as by placing the foot upon it, the belt is shifted and the Press stopped at once. The Shifter can be used independent of the Brake by the hand. 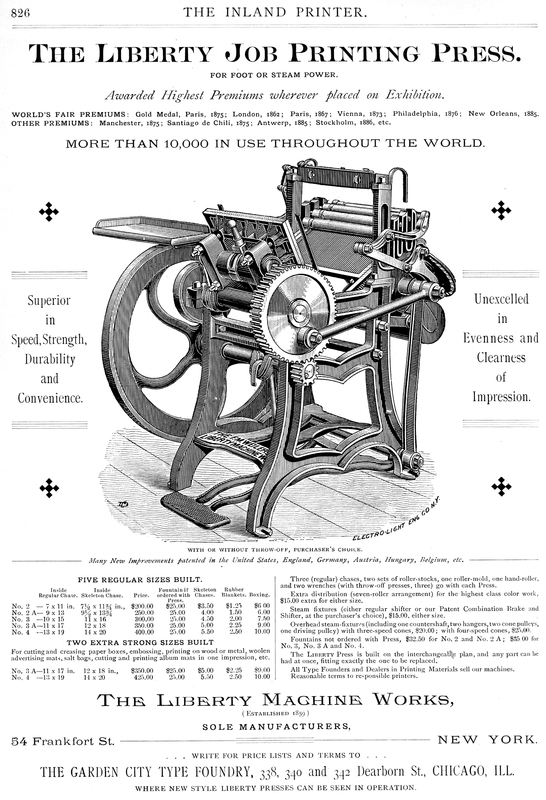 The manufacturer of the Liberty Press would often be listed in the Inland Printer Business Directory under the category Job Printing Presses. facturers of the Liberty Press.